This vegan version of a Greek favourite swaps the usual white sauce for an equally creamy, yet dairy-free butternut squash topping. 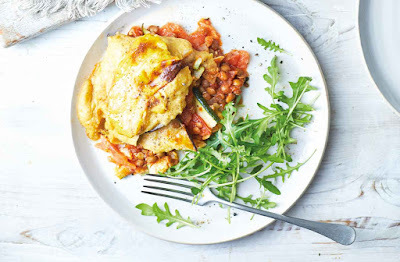 The hearty sauce is bolstered with filling lentils and layered between tender slices of aubergine, courgette and tomato. Heat 1 tbsp oil in a saucepan over a medium heat, add the onion and garlic and cook for 5 mins until softened slightly. Add the tomatoes, oregano, 150ml water and some seasoning. Simmer for 15 mins. Preheat the grill to high and line a large baking sheet with foil. Brush the aubergine and courgette on both sides with the remaining oil and put on the baking sheet. Grill for 3-5 mins each side until tender and golden. Preheat the oven to gas 5, 190°C, fan 170°C. Stir the lentils into the tomato sauce; simmer for 10 mins. Spoon half the sauce into a deep baking dish and cover with the courgette, followed by the sliced tomato; season. Spoon the rest of the sauce on top and cover with the aubergine. Set aside. For the topping, steam the butternut squash for 10-12 mins until tender, then blitz in a food processor until smooth. Melt the dairy-free spread in a saucepan over a medium heat; stir in the flour to make a paste. Remove from the heat and whisk in the cashew milk. Return to the heat, bring to the boil, then simmer, stirring, for 2 mins. Stir in the squash and season, then spoon the sauce over the aubergines. Bake for 25 mins. Serve with the rocket. Tip: To make this recipe gluten-free, simply swap the wholemeal flour for gluten-free plain flour.